Daily Objectives Poster "Learning Targets"
This is my daily objectives poster that remains hanging on my wall all year. I have placed velcro pieces under each subject where I hang each objective printed on a 5"x9" piece of card stock with velcro pieces on the back. It has made my teaching life so much easier! 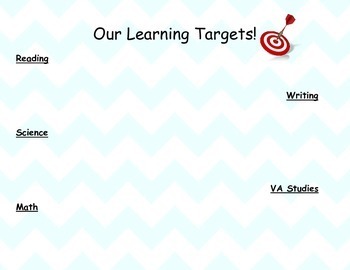 Stay tuned for the VA SOL objectives available that go with this poster. Note: I printed this using a poster maker at my school. The PDF version is made for a fourth grade classroom in VA.